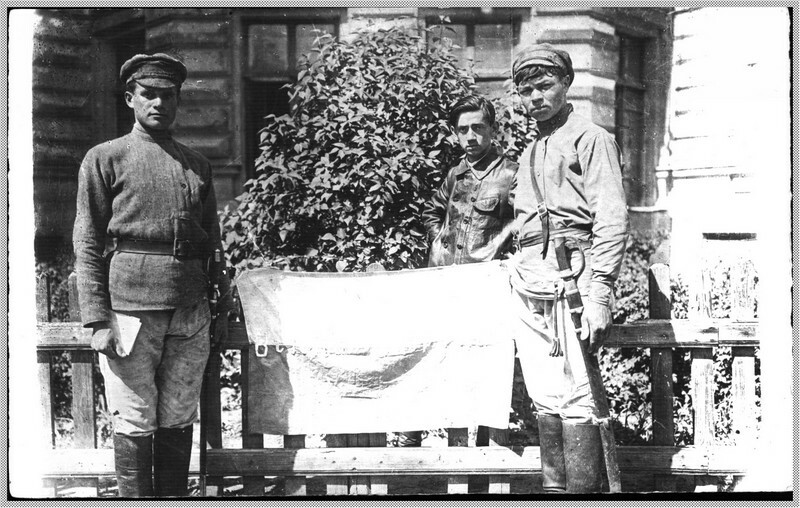 The preparations for my Ucranian Black Army goes very well. 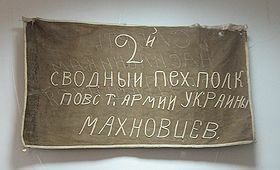 I ordered many toys and they're being delivered as we speak and I have started to do some research on Makhnovist flags. I remember that 10 or 15 years ago, before facebook anyway, information on the Maknovist movement was really scarse. There was an Anarchist History yahoo-group and some sites, all with the same three or four photographs. Most of the information was confirmed on the Back of Beyond yahoo-group, the Miniatures Page and Lead Adventure. The "Death to all those who stand in the way of the working people" banner is world famous by now and over the last ten years I've noticed a boom of t-shirts and other merchandise with various renditions of that banner. 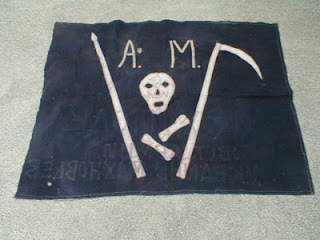 Two days ago I googled 'Makhno Flag' for the umpteenth time, I guess because there is something about the skull & bones flag that doesn't convince me. 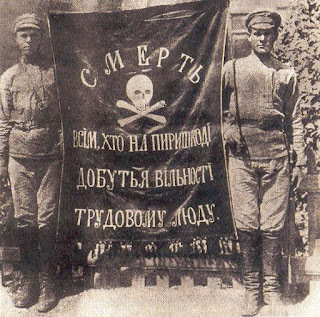 Mostly because the skull and bones image was usually used by Whites, as it was used by the freikorps in Germany and Latvia around the same time. 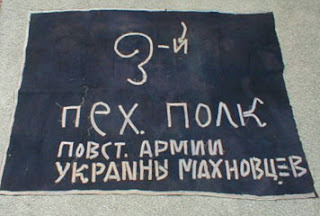 So I stumbled on this Reddit post and I read a reply stating that the famous banner isn't Makhnovist at all! And here is a picture of the backside of the banner. I've never seen this photo before. 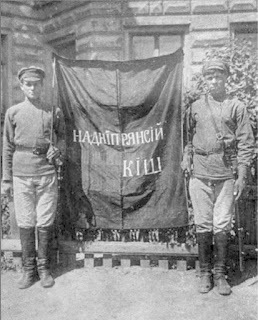 The same two soldiers apparently aren't Black Guard at all but Red Army soldiers with a banner captured from Ucrainian Free Cossacks, another faction in the Kiev area. Supposedly it says: "Kish [battalion] of Upper Dnipro", a (socialist leaning?) 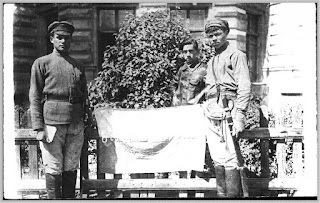 volunteer Cossack unit of the Ukrainian People's Republic. There you go, 15+ years of discussion on wargames forums destroyed. Just like that.